/ Modified jan 5, 2018 6:11 p.m. When it comes to creating policies that will preserve Arizona's water supply, Gov. Ducey said he wants to see stakeholders work together on long-term solutions. "We want to see the state speak with one voice regarding water," Gov. Ducey said. That type of collaboration is already visible in Tucson Water's efforts to conserve what it's allotted from the Colorado River. Most of that water can end up collecting in one of 20 sprawling basins that stretch across hundreds of acres at two sites. The Southern Avra Valley Storage and Recovery Project (SAVSARP), located just west of the Tucson Mountains, and the Central Avra Valley Storage and Recovery Project (CAVSARP), in Avra Valley, play a critical role in restoring water to Southern Arizona's aquifers. "By gravity, the water makes its way 300 feet down to the water table," Tucson Water spokesman Fernando Molina said. "It gives us the ability to store water over the years." Before switching to this method in 2003, Tucson pumped groundwater at a rate faster than aquifers could naturally recharge. Since then, the basins have become a conservation tool for cities outside of Tucson, including Phoenix. "This is Colorado River water that they can't use today. But if they don't use it, they don't have it later in the future," Molina said. "We worked out an agreement with them where they will store extra water in our recharge facilities at no cost to us." VIEW LARGER Tucson Water spokesman Fernando Molina. In 2017, Molina estimates the basins recharged more than 127,000 acre-feet of water back into the ground – roughly enough liquid to create a column that would span a football field and reach 24 miles high. 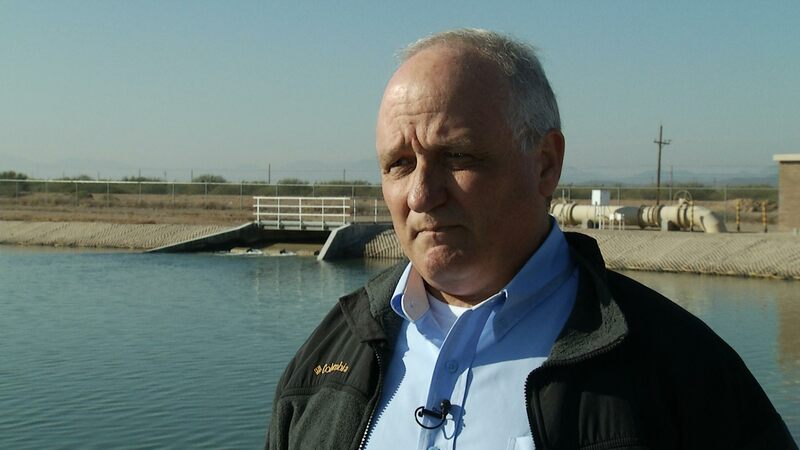 Storing water this way puts Tucson at an advantage when planning for potential shortages along the Colorado River, Molina said. However, the utility is also developing other conservation techniques. "Rainwater and stormwater for decades has been dealing with it as a nuisance, so you prevent flooding," Molina said. "That's a part of the urban water supply, we need to rethink how we use that." When looking ahead, Molina said Tucson Water is in the process of updating its 50-year water plan. That includes reassessing information related to the long-term availability of water from the Colorado River. For the time being, the utility will continue to help other communities store excess Colorado River Water at its SAVSARP and CAVSARP facilities so it can be pumped out and delivered for use when it's needed. "The advantage to the region is they stop pumping their groundwater wells. And we begin to see the water table rise when that happens," Molina said.